Peshmerga or Peshmerge (Kurdish: Pêşmerge, Persian: پیشمرگ‎, Pishmarg) is the term used by Kurds to refer to armed Kurdish fighters. Literally meaning “those who confront death” (Pesh front + marg death) the Peshmerga forces of Kurdistan have been in existence since the advent of the Kurdish independence movement in the early 1920s, following the collapse of the Ottoman and Qajar empires which had jointly ruled over the area. Peshmerga forces include women in their ranks. Many Kurds will say that all Kurds willing to fight for their rights are Peshmerga. The term remains in contemporary usage, sometimes written as pesh merga in Anglophone media. The Peshmerga has proven to be an effective army, providing security to all minorities. During the US invasion of Iraq the Peshmerga was directly responsible for the capture of Saddam Hussein. They also captured Osama Bin Laden’s messenger in 2004, which led to the death of the al-Qaeda chief. The term Peshmerga was first officially introduced during the establishment of the Mahabad Republic, a self-declared Kurdish state that lasted from 1946 to 1947. The term was used as the official name of the republic’s army. The army consisted of a number of former militias that united together under the command of Kurdish leaders, Mustafa Barzani and Qazi Muhammad. After the fall of the republic, Peshmerga regrouped as rebel organizations that would fight the Iran and Iraq governments for the next several decades. Through much of the late 20th century, Peshmerga often came into conflict with the Iraqi forces, using guerilla warfare tactics against them. Many of these Peshmerga were led by Mustafa Barzani and Mustafa Nerwai of the Kurdistan Democratic Party, while others were under the command of the Patriotic Union of Kurdistan led by Jalal Talabani and Kosrat Rasul Ali. After Mustafa Barzani’s death, his son Masoud Barzani took his position. Most of the Peshmerga’s efforts were to keep a region under the specific party’s control and to fight off any incursions by the Iraqi Republican Guard. Following the First Persian Gulf War, Iraqi Kurdistan fell into a state of civil war between the two major Kurdish parties the KDP and the PUK, and their Peshmerga forces were used to fight each other. Across the border in Iranian Kurdistan, the Kurdistan Democratic Party of Iran branded its fighters as Peshmerga and restarted its armed struggle against successive regimes in Iran. The Komalah party, a leftist group in Iranian Kurdistan, would also begin an armed conflict against Iran using its own fighters, also branded as Peshmerga. During World War I Kurds served as irregular and regular units in the Ottoman Army. Kurds made up a majority of the Ninth Army and supplied enough troops for many frontier units and 135 squadrons of reserve cavalry. These forces, with their experience and knowledge of the terrain, were contributory in fighting the threats to the Eastern Ottoman Empire. Although both the Turks and the British used Kurdish tribes to instigate cross-border conflicts, local shaykhs recruited Kurds to revolt against the regional powers. The first of these Kurdish call-to-arms occurred in British controlled Southern Kurdistan in May 1919. Shortly before being appointed governor of Sulaymaniya, Shaykh Mahmud Bazanji ordered the arrest of all British political and military officials in the region. 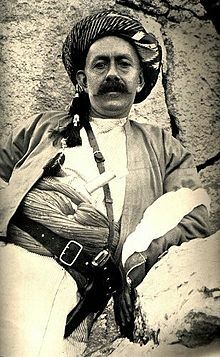 After seizing control of the region, Barzanji raised a military force from his Kurdish tribal followers in Iran and proclaimed himself “Ruler of all of Kurdistan”. Tribal fighters from both Iran and Iraq quickly allied themselves with Shaykh Mahmud as he became more successful in opposing British rule. According to McDowall, the Shaykh’s forces “were largely Barzinja tenantry and tribesmen, the Hamavand under Karim Fattah Beg, and disaffected sections of the Jaf, Jabbari, Shaykh Bizayni and Shuan tribes”. The popularity and numbers of Shaykh Mahmud’s troops only increased after their ambush of a British military column. Among Mahmud’s many supporters and troop leaders was 16-year-old Mustafa Barzani, the future leader of the Kurdish nationalist cause and commander of Peshmerga forces in Kurdish Iraq. Barzani and his men, following the orders of Barzani tribal shakyh Ahmad Barzani, traversed the Piyaw Valley on their way to join Shaykh Mahmud Barzanji. Despite being ambushed numerous times along the way, Barzani and his men reached Shaykh Mahmud’s location, albeit too late to aid in the revolt. The Barzani fighters were only a part of the Shaykh’s 500-person force. As the British became aware of the shaykh’s growing political and military power, they were forced to respond militarily. Two British brigades were deployed to defeat Shaykh Mahmud’s fighters at Darbandi Bazyan near Sulaymaniya in June 1919. Shaykh Mahmud was eventually arrested and exiled to India in 1921. At the root of the rebellion, Shaykh Mahmud’s leadership appealed to both Kurdish nationalist and religious feelings. Although he knew he could not directly defeat the British, Shaykh Mahmud hoped to seek recognition of Kurdish nationalism by advocating a ‘free united Kurdistan’. Using his authority as a religious leader, Shaykh Mahmud called for a jihad against the British in 1919 and thus acquired the support of many Kurds indifferent to the nationalist struggle. Although the intensity of their struggle was motivated by religion, Kurdish peasantry seized the idea of “national and political liberty for all” and strove for “an improvement in their social standing”. Despite opposition by other regional tribes, possibly fearful of the shaykh’s growing power, Shaykh Mahmud’s fighters continued to oppose British rule after the shaykh’s arrest. Although no longer organized under one leader, this inter-tribal force was “actively anti-British”, engaging in hit-and-run attacks, killing British military officers, and participating in another – left the Turkish ranks to join the Kurdish army. In response to the rebellion, the Turkish government, realizing the strength of Azadi, quickly arrested many of the organization’s leaders, both . In creating a battle plan, Said and the other prominent remaining Azadi leadership established five major fronts to be commanded by regional shaykhs. These shaykh leaders were assisted by former Hamidiya Cavalry officers who provided military structure to the rebellion. After organization, unit responsibility was divided among nine areas. The overall headquarters of Said’s military force was located in Egri Dagh and protected by a force of 2,000 men. During the onset of the revolt, Said’s fighters, facing nearly 25,000 Turkish troops, gained control of a vilayet near Diyarbakir. Besides seizing Turkish land and acquiring additional munitions, early victories instilled confidence in the rebellion and garnered further Kurdish support. Throughout the conflict, Said’s fighters used both conventional military tactics, including multi-front assaults and attempts at urban seizure, and unconventional warfare, including guerrilla tactics. An example of the conventional military organization was evident in the assault on Diyarbakir, where reports saw “three columns of 5,000 strong, under the personal command of Shaykh Said”. The establishment of conventional higher levels of Kurdish military command may also be assumed as documents Conditions also improved for Mulla Mustafa Barzani as he was eventually granted the privileges of a leader-in-exile. Throughout his years in the USSR, Barzani was able to broadcast via Soviet radio and attended courses in language and politics. Although many sources claim Barzani was given the rank of general in the Soviet Army, Massoud Barzani denies that this occurred. Possibly most important, however, was Barzani’s ability to correspond with Kurdish exiles throughout the world, including Jalal Talabani and Ismet Cherif Vanly. Meanwhile, the successful coup d’état of Brigadier Abd al Karim Qasim and his followers in Iraq in July 1958 opened a new chapter in Iraqi-Kurdish relations. Shortly after taking power, Qasim pardoned Shaykh Ahmad Barzani and allowed Mulla Mustafa, his followers, and his Peshmerga to return to Iraq. The Barzani exile in the Soviet Union ended after 12 years, and upon their return, the Peshmerga would once again play a prominent role in Iraqi regional politics. In September 1961, Kurdish leader Mustafah Barzani openly revolted against Baghdad’s authority. He started with 600 followers, but by spring 1962 had 5,000 full-time guerillas and another 5-15,000 who could be called to assist for short periods of time. When he attacked in autumn 1961 he caught Iraqi government forces, principally the 2nd Division, unprepared. Qasim ordered a counterattack, and the 2nd Division was able to reverse most of the Kurdish gains before Barzani’s forces were compelled to withdraw into the mountains during the winter of 1961-62. Secret negotiations between Barzani and Saddam Hussein led to the “March Manifesto”. The agreement included a pledge from the Kurds to stop their rebellion, and in exchange the regime would allow the establishment of a Kurdish autonomous region in areas where the Kurds were a majority. The agreement was to be implemented within four years. However during those four years the regime encouraged the “Arabization” of the oil-rich Kurdish areas. After decreasing the percentage of Kurds in the north for four years, the regime demanded the implementation of the manifesto. The Kurds weren’t willing to implement it. After the ultimatum extended by the Baath regime expired, the manifesto became a law on March 11, 1974. Clashes between the rebels and the Iraqi security forces erupted immediately. The fighting cost the lives of 10,000 Iraqi soldiers. The Iraqi army was unable to crush the rebellion because of Iran’s continual assistance to the rebels, Tehran even deployed two divisions of the Iranian Army inside Iraq in January 1975. Saddam Hussein, having committed to confrontation with the Kurds, was determined not to lose the fight. In late 1974 he began negotiations with the Iranian Shah Mohammad Reza Pahlavi. An agreement was reached and signed by the sides during an OPEC summit in Algiers. The Agreement guaranteed that Iran would stop assisting the Kurdish rebels. In exchange Iraq agreed to demarcate the joint border with Iran according to the Constantinople Protocol of 1913. In the 1913 protocol the border line in the Shatt Al-Arab was in the middle (thalweg) of the waterway, and not as was previously decided in 1937 between the countries. In the 1937 understanding Iraq’s territorial water extended to most of the Shatt. The Shah stopped the Iranian support to the rebels, withdrew his forces and sealed the border on April 1. The Iraqi army was able to crush the Peshmerga rebellion until the end of March. Many leaders of the Kurds, including Mustafa Barzani fled to Iran and others to Turkey. The Political Bureau (or central committee) of the KDP, led by Ibrahim Ahmed and his son in law Jalal Talabani, broke off from the KDP in 1966. in 1975, the Politbureau joined with other groups to form the PUK (Patriotic Union of Kurdistan). PUK quickly becoming the second biggest party in Northern Iraq, building its own force of Peshmerga. The PUK and the KDP developed an intense rivalry that would even lead to war between the two factions. During the Iran-Iraq War the Peshmerga rebels sided with Iran against Iraq. The Peshmerga’s support to Iran was an important factor in Iran’s early success on the Northern Front (Iraqi Kurdistan) and led to several successful Iranian military offensives but despite their gains the Iranians were unable to take control of any cities or towns of significance. The Iraqi military responded to the Peshmerga rebels by launching various military campaigns against them, and ultimately employed the use of chemical weaponry which lead to military success against the Peshmerga, however this claimed the lives of almost 100,000 Kurds. As a result of the victory against the Peshmerga, the Iraqi military was able to recapture several towns including the oil-rich Majnoon Islands. The Iraqi military received support from the Mujahideen-e Khalq, an Iranian rebel organization, and tried to invade Khouzestan as well as attack the center of Iran, however both of these campaigns failed with only small gains made. Iraq and Iran entered into a ceasefire at that stage and ended the war. The Iranians pulled out of Northern Iraq and Iran stopped supporting the Kurds in Iraq. Resistance to the Iraqi government continued for a few more months until the Peshmerga rebel forces were overthrown. In the wake of the First Persian Gulf War (aka “Operation Desert Storm”: January to March 1991), various considerations led the United States to establish two “no-fly” zones in Iraq: one zone was in southern Iraq, where the Hussein regime had viciously persecuted the Shiite Arabs; the other zone was in the Kurdish territory in northern Iraq. The Baghdad government was forbidden to operate any aircraft in either of these zones, a proscription enforced by United States and United Kingdom military assets in the region. Unable to use air power in the north, and with its conventional capabilities having been all but demolished during Desert Storm, Baghdad had little choice to but to sit by and witness the rebirth of the Kurdish self-governing region. The civil war among the Peshmergas of the PUK and the KDP held up the military development of the Peshmerga as the attention was no longer on outside threats. After the 1998 “Washington Agreement”, fighting between the KDP and the PUK Peshmerga came to an end. As active PUK Peshmerga put down their weapons, elder Peshmerga veterans began filling more political PUK roles. With the KDP increasingly led by Barzani family members, the political tension between the Kurdish parties remained. The emergence of strict, militant Islamic groups such as the Islamic Movement of Kurdistan in northern Iraq had by then already been an additional source of fighting and political tension for some time. The international prominence of al-Qaeda following the 11 September 2001 attacks on the U.S. led to the Qaeda-brokered creation of Ansar al-Islam, which further exacerbated sectarian violence. Although sporadic fighting continued with the PKK (the Turkish-based Kurdish Worker’s Party), the PUK Peshmerga faced its largest threat from Ansar al-Islam, which was also supported by the Ba’athist government. Led by Mullah Krekar, a Kurd of strict Islamic faith, Ansar al-Islam was composed of over 500 guerrilla fighters, many of whom fled Afghanistan after the U.S. Operation Enduring Freedom. Although they had faced traditional military opposition from the Iraqis and mountain-based guerrilla tactics during inter-Kurdish fighting, the PUK Peshmerga had difficulty countering the fanatical assault of Ansar al-Islam. The foreign fighters used suicide attacks, assassinations, mines, bombs, and swords and machetes to not only kill the Peshmerga but to desecrate their bodies. Whereas Ansar al-Islam allegedly received support from Iran, Saudi Arabia, and Iraq, the PUK Peshmerga had only the KDP forces as allies. Both parties were steadfast in their displeasure about the Ansar al-Islam presence. PUK commander Anwar Dolani, for example, asserted there is “no room for terrorism in Iraqi Kurdistan” and Massoud Barzani claimed Peshmerga forces did not need assistance to defeat the unwelcome militants. Despite Kurdish solidarity, U.S. preparations to oust Iraqi President Saddam Hussein brought welcome reinforcements to the conflict. The Peshmerga linked up with the CIA’s Special Activities Division (SAD) and the U.S. Military’s 10th Special Forces Group and prepared the battle space for conventional U.S. Military forces throughout Iraq. The first step was evicting the Ansar Al Islam from their enclave around the village of Biyara. This battle happened prior to the invasion in February 2003 and was carried out with officers from SAD and the U.S. Army’s 10th Special Forces Group. Most Ansar al-Islam fighters were killed during this operation, but some escaped to Iran and later regrouped in Iraq as the Ansar al-Sunnah. US and peshmerga spokesmen also claimed to have uncovered a chemical weapons facility at Sargat, the only facility of its type discovered in the Iraq war, which could not have been unnoticed by the government of Saddam Hussein. In addition, this team led the Peshmerga against Saddam’s forces in the north. Their efforts kept the 5th Corps of Saddam’s Army in place to defend against the Kurds rather than move to contest the coalition force coming from the south. The efforts of the SAD Paramilitary Officers and 10th Special Forces Group with the Kurds, likely saved hundreds if not thousands of lives of the coalition service men and women during and after the invasion. As an ally of the US-led coalition, Peshmerga forces fought side by side with American troops in the 2003 Iraq War in Iraqi Kurdistan. Since that time the Peshmerga have assumed full responsibility for the security of the Kurdish areas of Northern Iraq. In late 2004, when Arab Iraqi Police and ING (Iraqi National Guard) units in the city of Mosul collapsed in the face of an insurgent uprising, Kurdish Peshmerga battalions, who had recently been converted into ING forces, led the counter-attack alongside US military units. To this day, there are a number of Kurdish battalions of former Peshmerga in the Iraqi Army serving in Northern Iraq. These unit are mostly part of the reformed 2nd Division (Iraq), stationed in Mosul. In early 2005 it was speculated by Newsweek magazine that Peshmerga forces would be trained by the US to take on Sunni rebels in Iraq. It was estimated that in 2005 there were 180,000 Peshmerga fighters in Iraqi Kurdistan, the article estimating their number to be 270,000 in total. A recent CBS News reports places their number at 375,000. In 2008 many Peshmerga soldiers were put into new formations under the interior ministry, one of which are the Zeravani whom are loyal to the Kurdistan Democratic Party. Back in 2008, the Zeravani was a force of 8000 soldiers, but have grown in numbers (to 25 000 as of 2011) and now operate seven bases inside Iraqi Kurdistan. One of the bases is a dedicated airbase for training on ultralight fixed-wing aircraft (Ikarus C42). The Zeravani forces are led by Brigadier General Aziz Waysi Bani. The Peshmerga were an active partner in the American-led coalition in Iraq. Many Peshmerga are fluent in Arabic, in contrast to foreign coalition troops, and they therefore played an important role in the Sunni triangle of Central Iraq. On the strategic level the Peshmergas are ready to fight a guerrilla war of any invasion of Iraqi Kurdistan. In 2012 the Kurdish leadership put in effect a program to unify the Kurdish forces of PUK and KDP, both of which operated as separate armies inside the region before the unification. The unification program plans on having a total size of 18 brigades, which will be finalized by mid-2014. The Peshmerga is organizing its own SOF force which will incorporate many of the Cobra battalions. The Cobra forces are elite infantry units inside Peshmerga. The Cobra forces can be found in many factions inside Peshmerga, including the Presidential brigade (in Baghdad, have three Cobra companies) and Intelligence battalion (Identical with the Presidential brigade, except it has a scout company equipped with the BRDM-2 armoured patrol car instead of the third cobra company). Many military experts also speculate that the EC120Bs and the MD530F which the KRG is getting might be used as helicopter support for the SOF brigade in the future. The mentioned helicopters are officially for interior police forces. The Peshmerga have traditionally had a problem with funding, mainly due to their large size. The Peshemrga forces had no live training on their heavy weapons up until 2011 due to lack of ammo. The problem was tackled after it was put on the media spotlight. Now all heavy weapon-formations have at least 320 hours of live-fire training and taken part in 6 large military exercises. The Kurdish leadership will also be cutting the size of Peshmerga to pave way for a faster modernization of the Kurdish forces. Peshmerga in Iraqi Kurdistan said they had taken control of the city of Kirkuk and provided logistical assistance to Iraqi government troops, during the 2014 Northern Iraq offensive by Sunni militants. Unlike the other militias, the Peshmerga were not prohibited by the transitional government; the Kurdish army has been formed out of the Peshmerga. They are usually armed with AKMs, RPKs (light Soviet machine guns) and DShKs (heavy Soviet machine guns). During the American-led invasion the Peshmerga captured the rest of the arms of the Iraqi forces, consisting of more than 2,000 armored vehicles (some hundred of them PT-76s and a smaller number of T-55s) and an unknown number of artillery pieces.
. Slate.com. Retrieved 16 June 2014. The New York Times, for example, uses the term “pesh merga”; see search results of archive. Ephraim Karsh and Inari Rautsi-Karsh – Saddam Hussein: A Political Biography (The Free Press, 1991). pp. 67-75.
in Genocide in Iraq: The Anfal Campaign Against the Kurds (Human Rights Watch Report, 1993). J. M. Abdulaghani – Iraq and Iran: The Years of Crisis. Baltimore, The John Hopkinks University Press and London, Croom Helm, 1984. p. 142. C. Kutchera – Le Mouvment national Kurde, Paris Flammarion, 1979. pp. 322-323.
. Middle East Quarterly: 13–24.
. The Wall Street Journal. Retrieved 2014-06-13.